Since Mike Mignola's Hellboy first hit the stands in 1993, it has become a cultural sensation, racking up a dozen Eisner Awards and inspiring numerous spinoffs, from a novel line, to video games, to feature films. Now, Dark Horse is pleased to present the comics that started it all, collected in deluxe hardcover editions. Sized at a generous 9" x 12", and handsomely bound to match The Art of Hellboy, each volume contains two complete story-arcs-the equivalent of two full trade-paperbacks. Each volume of the Hellboy Library Edition also includes extensive supplemental materials, including previously unreleased sketches and designs. 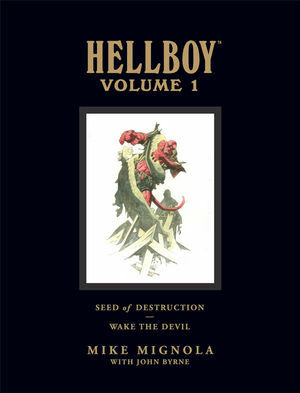 * Hellboy Volume 1 collects the first two story-arcs-Seed of Destruction and Wake the Devil-with the original introductions by Robert Bloch and Alan Moore. * Expanded Mignola sketchbook sections. Available for the first time as a hardcover collection!